You can infinitely tell a lot not only about the history of the city, but also about its architectural monuments. 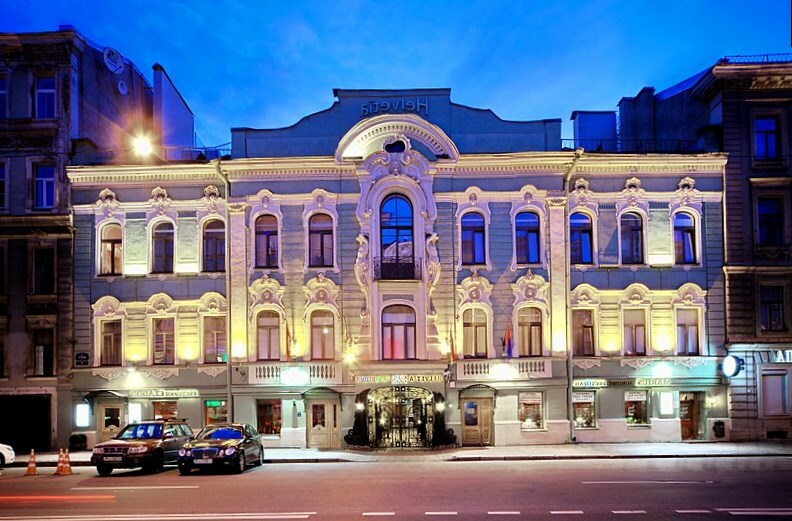 Buildings that were built in St. Petersburg until 1917, almost have preserved in total. From the Neva to the Obvodny Channel and from the Alexander Nevsky Lavra to the port it looks almost the same as before the October Revolution. St. Petersburg at the same time combines the buildings constructions of completely different architectural styles. The architecture of Peter is so varied that during the process of building of Mikhailovsky or the engineering castle (now it is the Russian Museum) it was necessary to make all four facades of building different. The castle is fulfilled in such way to achieve harmony with the surrounding architectural environment. The castle was built during the reign of Paul I, who owns the idea of the creation and the first sketches of the castle. Fact 2: What is preserved in the ball of the Admiralty Spire? The Admiralty is prettified with a spire, that is more than 70 meters high, with a gold-plated ship weighting 65 kg on its edge. The weight of gold that was spent for gilding - 2 kg . 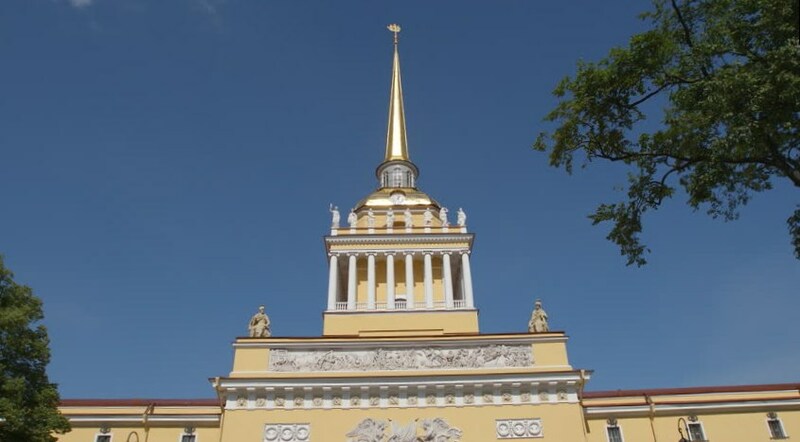 There is a legend that inside the gold ball on the spire is retaining the thrift-box with examples of all gold coins, made from the moment of the foundation of St. Petersburg. This ball is really hollow, but there are retaining, of course, not gold coins, but the masters' reports on repairs of the ship and the spire throughout the history of the building's existence. During the war, protecting the spire from bombing, the residents of Leningrad sewed a special case for him. On the Palace Square there is a solemn, white columns and gilt Winter Palace, designed by Rastrelli, that was built in 1754-1762. When the construction was finished, the Palace Square was filled up with debris. Emperor Peter III could get rid of rubbish in a simple and original way - he ordered to announce to the people that everyone can take anything from the square for free. A few hours later, the entire area was cleared. Fact 4: How long will it take to view the Hermitage? 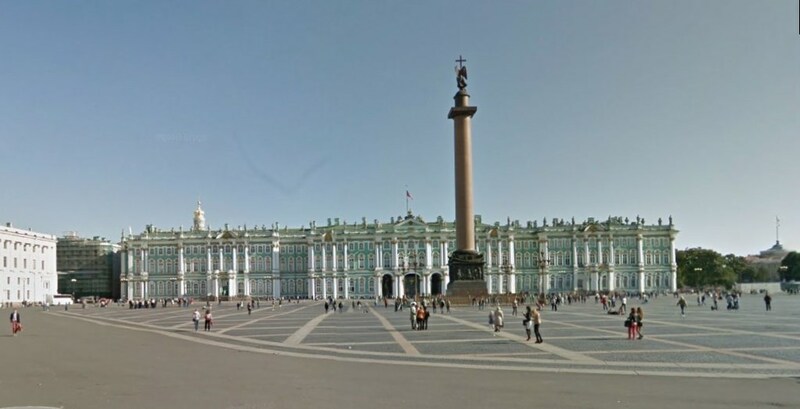 The Winter Palace is the main building of the Hermitage. 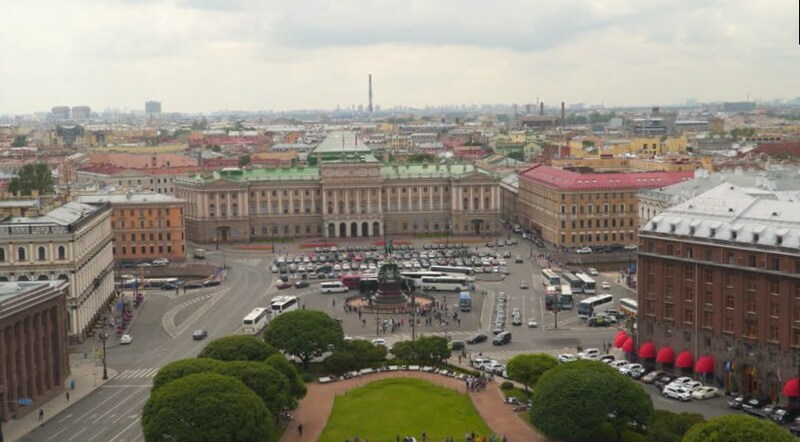 The entire architectural complex of the Hermitage consists of several buildings on the Neva quay - this is the Winter Palace, the eastern wing of the Main Staff, the Fund's storage, and the Menshikov Palace. The collection of the Hermitage consists of almost three million monuments of worldwide culture and history. It will take several years to get around the Hermitage, stopping at each exhibit, at least for a minute. Of course, the most beautiful monument is the arch of the General Staff, crowned with the sculpture of Glory on the chariot of Victory. This chariot is a symbol of Russia's victory in the Patriotic War in 1812. Initially, arch was designed by Alexander I in a strict, sustained style, without a crowning chariot. However, Nicholas I, which has changed Alexander I in the reign, decided to glorify the courage and valor of the Russian army. In the end of arch building, Nikolay I doubted its reliability. To confirm the quality of his work, the architect of Rossi, after disassembling the construction timber, with all the workers climbed to the arch. As it turned out, the structure withstood their gravity. This legend is written by the biographer Rossi Panin from words of the architect's granddaughter. Aleksander column is devoted to the victory of Russia in the war with Napoleon. The figure of an angel with a cross crowns a column, which height is 47.5 meters and weight is about 700 tons. The column isn’t fixed by anything and holds on the plinth solely under the gravity of its weight. For the first time, the inhabitants of the city were afraid to walk near the column and evaded her sideway. Then the author of the monument, Monpherran, began to walk around the column every day, convincing the citizens by his own actions in the safety of that construction. St. Isaac's Cathedral is the largest cathedral in Russia and the fourth largest in the world. Climbing along the narrow spiral ladder of St. Isaac's Cathedral to the height of 43 meters, you can see the whole city. Despite this, during the period of the Great Patriotic War, the Cathedral was never subjected to direct artillery bombardment- the only accidental projectile hit the western corner of the cathedral. There is an assumption - the reason is that the fascists used the city's highest dome as a landmark for a gunning. Perhaps, thus, the authorities hid in the basement of the St. Isaac's Cathedral values from other museums that they had not managed to take away to the beginning of the blockade. Also interesting is the fact that on the gilding of the main dome and the domes of five belfries it was spent almost 100 kg of red gold. During the blockade, the inhabitants of the city hid this magnificence under a layer of gray paint. On Isaac's Square you can see another unique monument - a monument to Nicholay I, designed by Monpherran (the same person who designed the Alexander Column), but a monument was made by P. Clodt, the same who made handlers of horses on Anichkov Bridge. 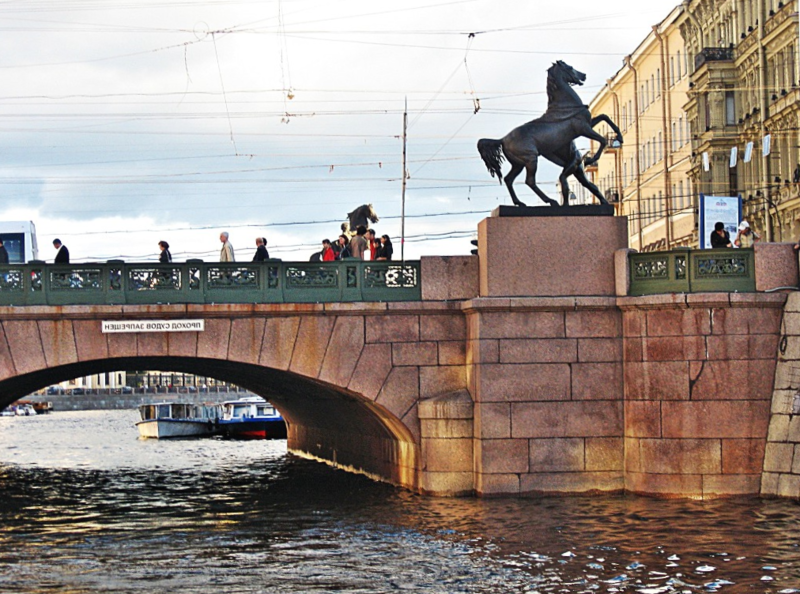 This is a unique equestrian sculpture on two points of the pillar, is the only one in the world. Nikolay sits on a horse and is turned to the St. Isaac's Cathedral. The fact that the horse handler turned away from the palace served as a formal reason for the daughter of Nicholay I to refuse to reside in the palace, despite the fact that it was a present to her on the occasion of her wedding. It is impossible to ignore Petrodvorets or Peterhof, which is situated in the suburbs of St. Petersburg. 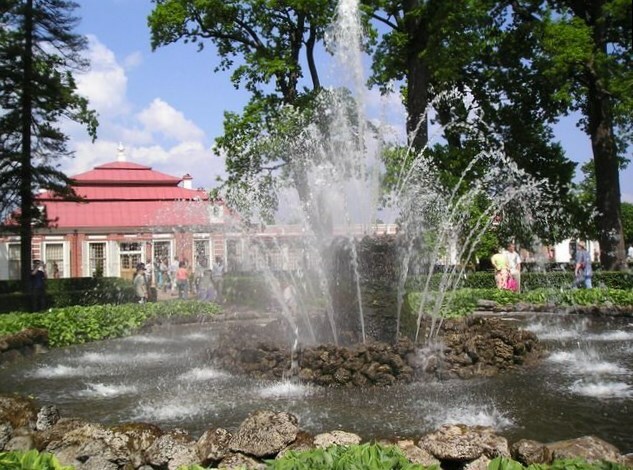 There are 173 fountains and 3 cascades to this day in Peterhof. In 1990, this ensemble of fountains was recognized by UNESCO as a worldwide cultural heritage. Peterhof's fountains are a real engineering miracle: pumps have never been used for water supply here. Water comes here naturally from the Ropshinskih heights along the channel of the Shinkarki River and another whole system of canals, ponds and gateways, called the Ropshinsky sluice-way. This natural feature was noticed by Peter I in 1720 and he decided to use it for the decoration of Petrodvorets, instructing to develop the system of communication vessels to the engineer-hydraulics Vasily Tuvolkov. This system operates to this day, only the pipeline is replaced from wood to cast iron. An interesting fact is that, according to Peter I's plan, in the center of a large cascade there should have been a figure of Heracl, defeating the Lernei Hydra. The figure should have symbolized Russia's victory in the Northern War. However, the successors of Peter found a more successful symbol of this victory. The battle of Poltava took place in the day of St. Samsonii Strannopriemets, and the key figures on the Swedish blazon are the figures of the lions. Therefore, the Biblical story about Samson, who defeated the lion, was the most suitable for this allegory.